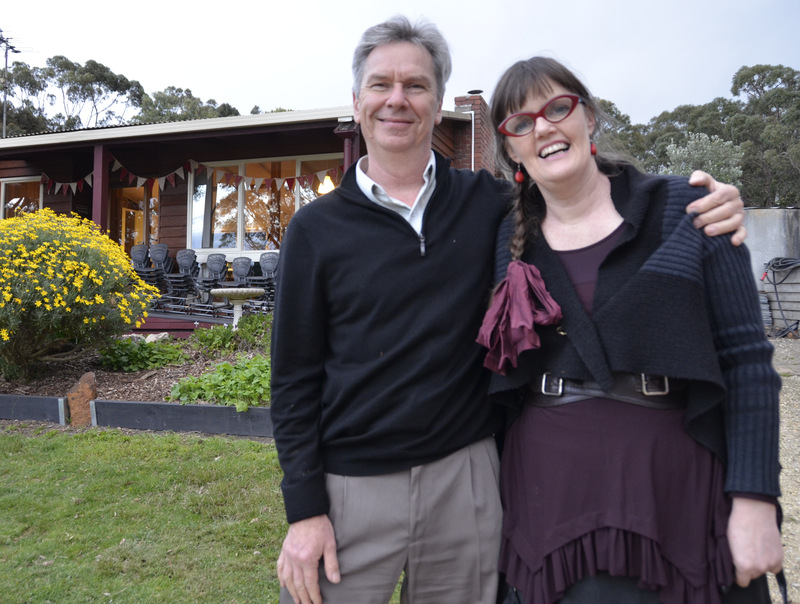 Recently, my friend Di Schulze asked me if I would go down and do a House Concert, in Bambra, in her wonderful home, at Countrywide Cottages. When I said yes, Di immediately applied her amazing entrepreneurial spirit to organizing the event and rallying the local community. 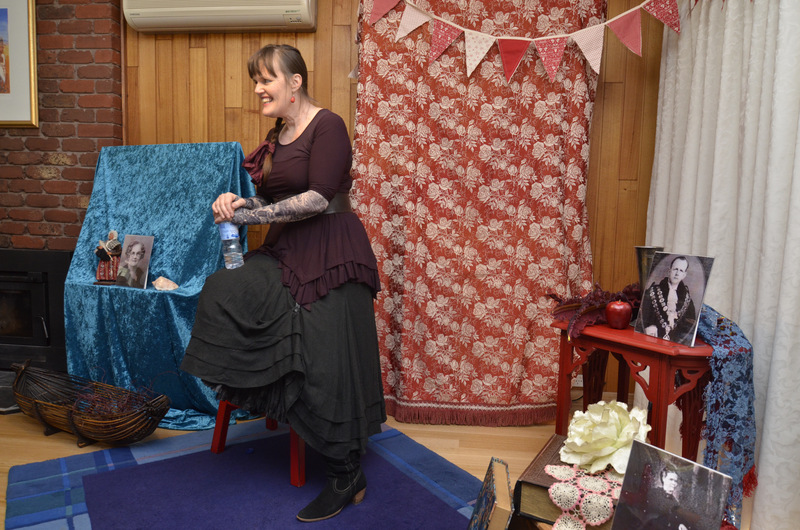 What had been one afternoon of storytelling quickly became two afternoons, September 5th and 6th and then shows at two local primary schools were added. In addition, Di had local businesses donate wonderful prizes of local olives, wines, jams and massages for a raffle. By the end of the weekend we had raised close to $2000, in support of my upcoming trip to Ireland, where I will be performing and undertaking research for my storytelling practice. What a result! Having grown up around Geelong and spent many weekends in Deans Marsh, as a teenager, I really enjoyed returning to this beautiful, green part of the world. I arrived to a warm welcome, which was extended across my stay. Soon there were cuppas, in the warmth of the fire and final planning for a big weekend of storytelling. Di had some calico and suggested we paint a sign saying ‘Stories’ to hang on the fence. I volunteered jumping on a sewing machine and ‘whipping up something’ that would endure all weathers, thinking that this would take no time at all. I began on the Thursday night, but of course, it took more than one session to get it done. Do you ever imagine you will ‘just whip something up’ and then remember when you are well into it that things take time? 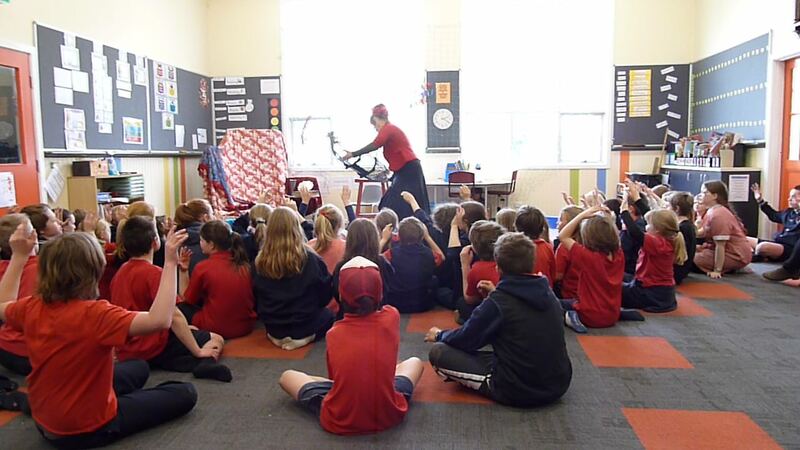 On Friday morning, it was off to Birregurra Primary School for a show for the whole school. Principal Sue Dodds welcomed me warmly and the children were a delightful audience, very willing to contribute sound effects when necessary and full of questions when I was finished. It is the first time I have performed with a cow in the room. I love cows and was very impressed by this life sized cow that had been artfully painted by the students. 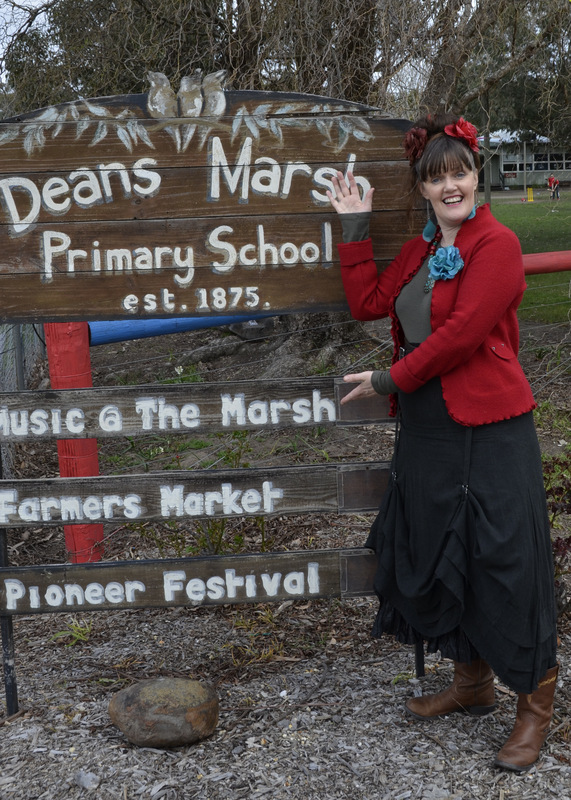 After a quick bite of lunch in Birre, I drove across to Deans Marsh Primary School to set up for the afternoon show. Two delightful young students proudly took me on a tour, showing me the best climbing tree, their chickens and lush vegetable garden, the brick pile that would one day make a shed and the special animal carvings at the front of the school. The cow at Deans Marsh was unfortunately in the hallway, so she missed the show, but I did say hello to her afterwards. After their lunch, the children all came in and the show began. They were also a wonderful audience and made an incredible flock of seagulls for me, in one of the stories. There were questions after the show and then the Principal, Murray Surkitt, gave out awards to students who had been working very hard and achieving great personal results. Their school captain, Will, shook my hand firmly and thanked me for coming on behalf of the students. He is an impressive young leader. 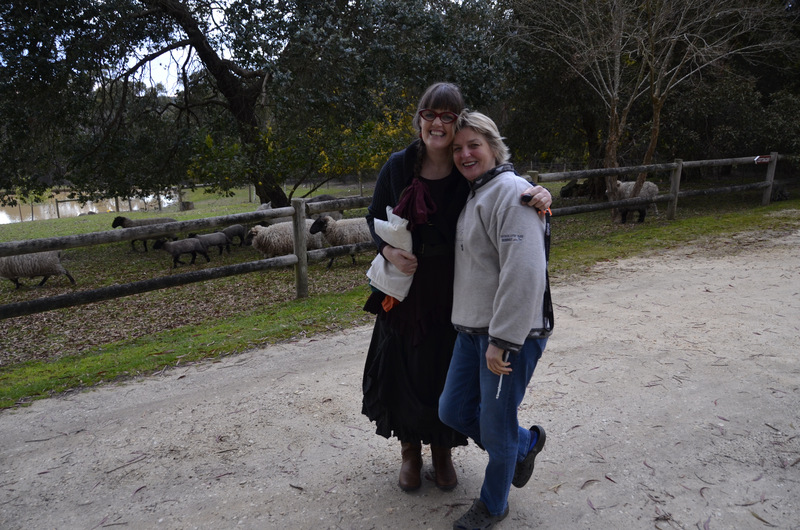 On the morning of my first show at Countrywide Cottages, a lamb was born right across from the house, before breakfast. It was lovely to watch the ewe, a first time mother, tend to her lamb and bond with it. I took this as a great blessing on the day! There was a lot of setting up to be done and Di and Stu got on a roll bright and early. Stu and I hung flags along the drive, to mark the gate from the road and make a festive avenue for the audience to arrive through, topping it off with my ‘Stories’ banner. Di had spent hours making festive bunting that we hung around the stage and the afternoon tea outside. Our mutual friends, Joan and John, arrived from Melbourne and gave a great help with final preparations. While I was limbering up, everyone else was flat out with the final set up. 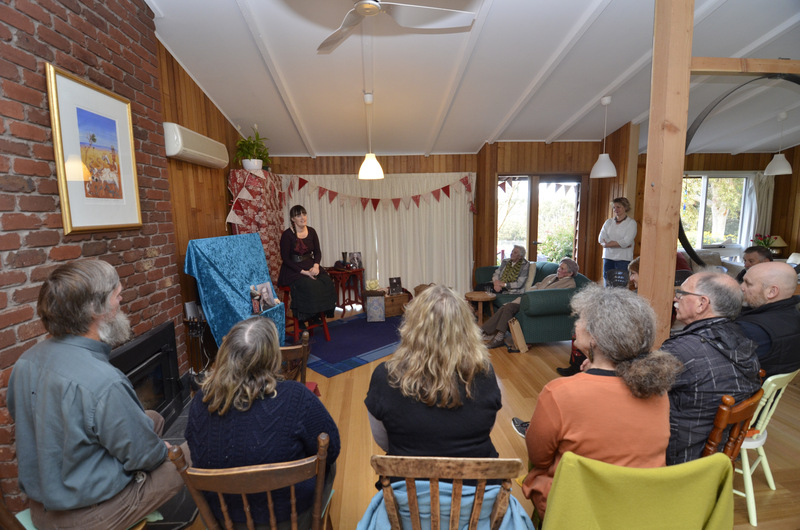 The house was warm and welcoming, there was food and wine aplenty, the guests arrived and settled in for an afternoon of stories. The next day, we did it all again. In one of the question times it was great to hear one of the locals, Andrew, a natural storyteller, recount the tale of the “Bambra Lights.” One of the great perks of storytelling is that people share their stories with you – and this one was a ripper – super spooky! By the end of these events I was full of admiration for this community, their welcome, their strong networks and all the lively things that they have going on. House Concerts are a great way to share stories, because you really get to meet people and the intimacy of the event has a powerful effect on the stories, the listeners and also me, as the teller. With all the treats on offer, good old fashioned hospitality and the beautiful countryside to enjoy, I highly recommend a Spring or Summer jaunt along the Otway Harvest Trail! My heartfelt thanks go to Di and Stu for the huge amount of time, thought, effort and creativity that went into making the weekend happen and for welcoming me so warmly into their home. It feels like the very best send-off for my trip to Ireland!